Form RTC-60 or the "Renters' Tax Credit Application" is a form issued by the Maryland Department of Assessments and Taxation. 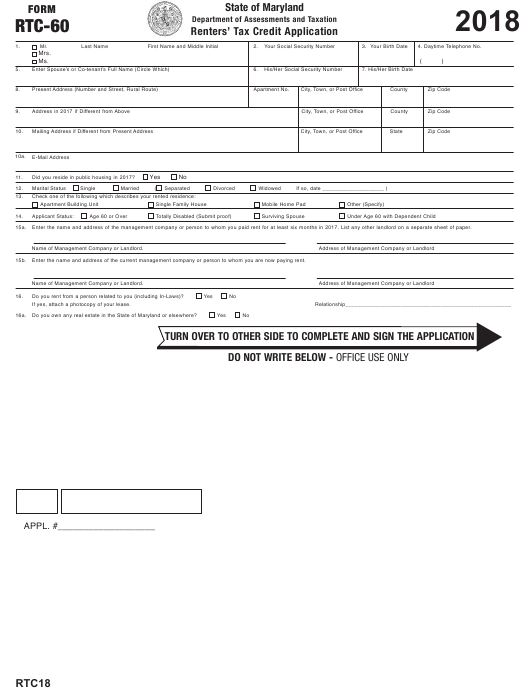 Download a PDF version of the latest Form RTC-60 down below or find it on the Maryland Department of Assessments and Taxation Forms website. Did you reside in public housing in 2017? Enter the name and address of the management company or person to whom you paid rent for at least six months in 2017. List any other landlord on a separate sheet of paper. Name of Management Company or Landlord. Enter the name and address of the current management company or person to whom you are now paying rent. Do you rent from a person related to you (including In-Laws)? If yes, attach a photocopy of your lease. Do you own any real estate in the State of Maryland or elsewhere? Maryland and meet certain eligibility requirements. Renters age 60 and over or those 100% disabled as of December 31, 2017, see CHART 1 below. do not receive Federal or State housing subsidies or reside in public housing, see CHART 1 & 2. CHART 1 - AGE 60 OR OLDER OR 100% DISABLED. 1. Find your approximate 2017 total gross household income in Column A.
should apply for the credit. CHART 2 - UNDER 60 YEARS OF AGE. residents of your dwelling is below the following guidelines, you are encouraged to apply. comparing rent and gross income. electric or heat, you may need to have as much as an 18% higher monthly rent to qualify for a credit. Trailer park residents are advised to submit an application and allow this office to determine eligibility. submit an application, the State will determine your eligibility. 1. WHO C N FILE? regardless of its source or taxability. receipts, or other proof of rent paid. support yourself must be reported. for the trailer pad or lot. first page of this form. to pay the rent and other living expenses. terms reported by the applicant. 17. List all household residents who lived with you in 2017. (If none, write NONE.) You must answer this question. 18. Did or will you, and/or your spouse, file a Federal Income Tax Return for 2017? married filing separately, a copy of your spouse’s return) with all accompanying schedules must be submitted with this application. 21. Do you receive any rent subsidy? 22. Which utilities or services were included in the monthly rent: If none, check None. Applications are processed in the order in which they are received if additional information is not required.